Home - Haven Dance Academy - Ballet, Tap, Jazz, Modern & Hip Hop Dance Classes for toddlers to adults! Register now at Lynnwood's premier dance studio! Join us for expert and nurturing instruction for ages 2.5 to adult. Classes include Ballet, Pointe, Jazz, Hip-Hop, Tap, Modern/Lyrical, Acro, and Teen/Adult Fitness. Join us for fun camps, intensives, and classes for the whole family! Dance classes for children start with our toddler program at age 2.5 and encourage dancers to experience the beauty of dance. Instructors offer a caring and nurturing environment for students to learn and grow in their dance technique. We offer all styles of dance and levels so there is an option for every child whether they are pursuing a lifetime of serious dance or a beginner. Our schedule allows for teenage students of all levels and abilities to have a positive dance experience. For our more serious dancers we have qualified instructors that will push them in technique while still caring for each individual. Performance opportunities are offered throughout the year in our Nutcracker, performance teams, and recital. We also have wonderful classes for beginning and intermediate level students in Ballet, Tap, Hip-Hop, Jazz, Acro, Modern/Lyrical, and Fitness. We have several dance classes dedicated solely to our adult dancers. You can expect a welcoming and non intimidating environment to move and enjoy dance and fitness at the studio. Registration can be done on a monthly basis or with a class card, trial classes are $15.00. We are always looking to expand our adult class offerings so if you don’t see what you are looking for, please reach out! 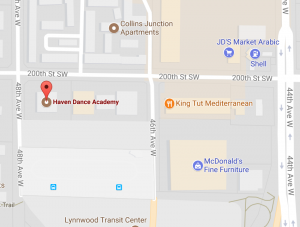 Welcome to Haven Dance Academy! We are located in Lynnwood, WA just a 1/4 mile from I5 next to the Park & Ride. 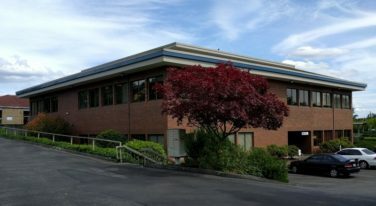 Our professional facility has quadruple sprung floors, ample parking, and is easy to get to from surrounding areas like Seattle, Edmonds, Shoreline, Mountlake Terrace, Everett, Mill Creek & Bothell. Open to all ages and abilities, we offer dance classes for toddler’s, children, teens, and adults. 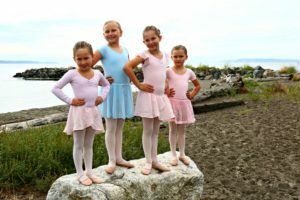 Classes include Ballet, Creative Movement, Pointe, Tap, Jazz, Hip-Hop, Modern, Acro, Musical Theater and Contemporary styles for girls and boys. Private lessons with our caring instructors are also available! Dancers have the opportunity to showcase their hard work throughout the year by performing in our Nutcracker Suite, participating in Charity Dance Project, at our big June Recital, and In-Studio Performances for family. ATTENTION: Tickets for the 2:30 recital showing are SOLD OUT! Please contact us if you did not purchase your tickets in time to be put on the wait list. We are doing everything in our power to ensure everyone with a child performing will be able to attend.